Crack open a couple cold ones, but not too many, because you're gonna want to remember this week's episode of Almost Tuesday! Lucas Gardner calls in with an EXCITING ANNOUNCEMENT about a new acting role and also his fraught relationship with his mailman. Braden Stewart gets into the mix to describe his corporate idolatry. Chris Thompson says his piece about the great Muhammed Ali, and musical powerhouse Jim Watkins performs two songs live. Andrea Springer and Jack Slavny hop in on the grab bag segment to talk about Radiohead and getting wasted. Can't take the summer heat? You're in luck: this week, we've got a real chill episode for you. Jon and Kara took a well-deserved holiday this week, so Woody is at the sound-helm. Comedian extraordinaire and Rochester native, Chris Alan, joins us for the first hour and tells us about his experience opening for Amy Schumer in his hometown in front of 10,000 people. Chris Thompson, Malcolm Whitfield, and Andrea Springer join in the conversation and talk about baby nihilists and current events. In this stellar week of Almost Tuesday, Woody tries fruitlessly to get guests on board for his Mars expedition. We're incredibly jazzed to have interview guests Heather Zajkowski and Ross Johnson from WAYO's The Sound of Tomorrow to talk about radio, poop suits, and their ongoing attempts to gain the notice of Ira Glass. Dave Chisolm and Elise Hughey of Talking Underwater grace us with two top-notch live performances, and Chris Thompson horrifies Woody with his plan to abolish the "urinary patriarchy" in The Chronicles of Nonsense. 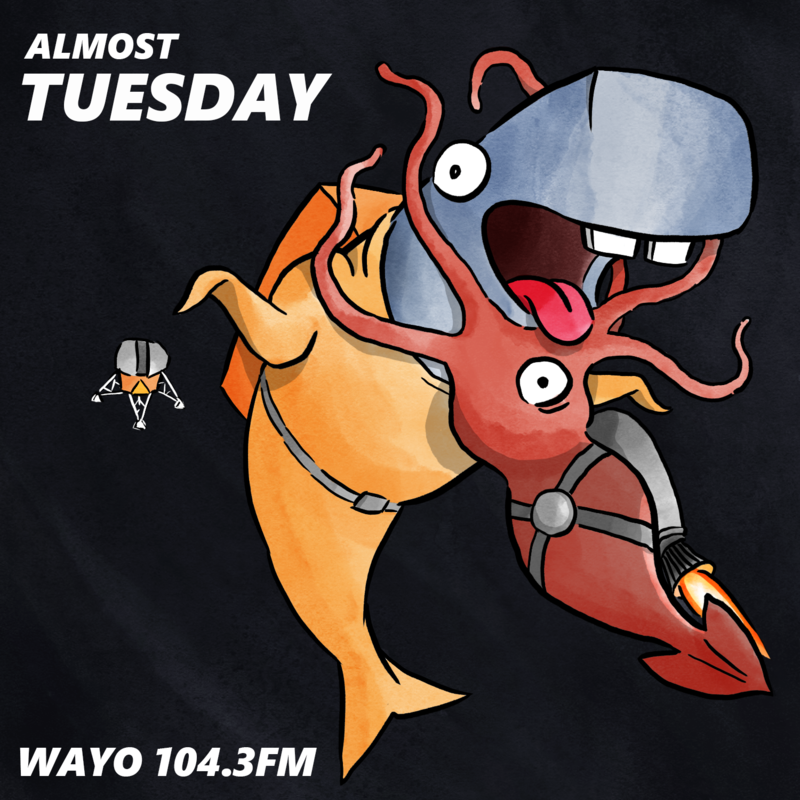 Saddle up for this week's episode of Almost Tuesday! It's a wild ride. This week features improv team Stinky Bishop, which is comprised of Rob Ferries and Andrea Springer. Woody joins in the improv shenanigans as a dachshund-loving salesman caught in the middle of a family feud. Malcolm Whitfield and Kara Maillie produce this week's show and discuss mundane superpowers and what really comprises a tri-county area. Fight Fight Fight! This week our friends chat about fights, scuffles, revenge and bullies! Musical guest Rosehip plays two astounding live songs, Madelein Smith talks about a years-long plot for quasi-justice, Lucas Gardner calls in from THE BIG CITY with a story of theater prima donnas and personal injury, Becca Barnum talks comic books and joke testing, Andrea Springer gets in on the tales of fisticuffs, and Chris Thompson delivers a new Chronicles of Nonsense with the help of producers Kara Maillie and Malcolm Whitfield. Lady Luck is a fickle mistress. We discuss that and much more on this week’s episode of Almost Tuesday! We were fortunate to have the hilarious Ralph Tetta as our interview guest this week, and he reminds us that a good comedy club should be free of fossilized pizza. Our music guest is Brian McCormick, who plays some of his awesome tunes for us. Chris Thompson offers Woody as a sacrifice to prevent God from killing more of his favorite celebrities. Today, Almost Tuesday is all about honoring musical icons that left us too soon. We pay homage to the legendary Prince and to music pioneer Richard Lyons of Negativland. Woody interviews Ryan Jennings about Prince’s legacy and regales participants in the Grab Bag segment with a tale of U2, Negativland, and Casey Kasem. Braden Stewart contributes an odd awesome audio piece sampling the work of our two central subjects, and Jacob Walsh and Ben Burdett from Total Yuppies amaze us all with two songs featured on their upcoming EP. This episode's a real workout: Danielle Raymo comes by to get interviewed about cofounding and expanding The Rochester Brainery, Ryan Yarmel gives us a sneak preview of a track from his forthcoming album and then plays a song live, and Jon Laurin and Kara Maillie chat it up with Woody about fitness and brick-children. Plus a great grab bag discussion about Karaoke and Zoology with Andrea Springer, Malcolm Whitfield, Danielle and Rob Ferries. What would you do on your first date with Donald Trump? Chris Thompson answers that question with his tale of attending the Rochester Trump rally this weekend in an episode-spanning Chronicles of Nonsense! Kara Maillie gives us some extremely situation-specific date ideas! BIG GUEST: we speak to Woody’s old friend, comedian from Finland Olli Siiki who talks about what the Finnish comedy scene is like and how Robin Williams changed his life. Today Woody gives back to the community by offering unexpert advice in the realms of psychology and human interaction with the help of Jon Laurin and Kara Maillie. Many people call in and share their problems and Woody drops an advice bomb on all of them. Also Chris Thompson returns with The Chronicles of Nonsense, with the aid of Kara and our old friend Larry, and our music guest is Ben Morey from the devastatingly good band Howlo to play two live songs and talk about juggling different music projects.